Designed with the numeric keypad, navigation keys and common keyboard shortcuts on the left side, the Left-Handed Mechanical Keyswitch Keyboard from DSI enables left-handed users to transfer a significant portion of their keyboarding workload to their stronger, dominant side. The Left-Handed Mechanical Keyswitch Keyboard offers a full 104-key layout, with high quality Cherry Red linear mechanical keyswitches for a stable, low force feel and long-lasting durability. Note: Regardless of the type of keyboard used, all users risk overreach injuries whenever they position devices in such a way that they must reach over one device to access another. The Left-Handed Mechanical Keyswitch Keyboard can help a left-handed user reduce the risk of overreach injury only if the user is able to mouse with the right hand. Construit avec le pavé numérique, les touches navigations, et touches raccourcis les plus communs à la gauche, le clavier Left-Handed Mechanical Keyswitch Keyboard de DSI permet les utilisateurs de transférés un gros volume de travail du clavier au côté principal le plus fort. 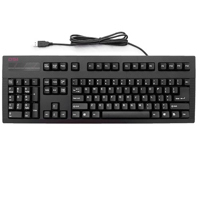 Le clavier Left-Handed Mechanical Keyswitch Keyboard offre une disposition de 104 touches, avec des interrupteurs de haute qualités de mécaniques Cherry Red linear pour la stabilité, la pression bas et la durabilité. Veuillez noter: Peut importe le type de clavier utiliser, toutes utilisateurs sont à risque des douleurs en s`étirant pour atteindre la souris chaque fois qu`ils positionnent les dispositifs dans une mannière qu`ils doivent s`étirer par-dessus un dispositif pour atteindre l`autre. Le clavier Left-Handed Mechanical Keyswitch Keyboard peut aider les utilisateurs à la main gauche de réduire cette risque de s`étirer pour atteindre la souris seulement s`ils peuvent faire la souris avec la main droite. 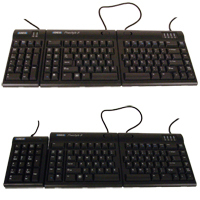 This is actually a modular keyboard which allows you to move each component to any preferred location, one configuration of which is as a left handed keyboard as pictured at right. 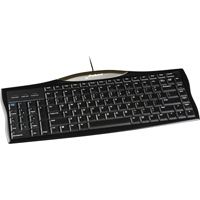 The Freestyle2 offers a number of unique ergonomic features but some prefer to arrange the components as a left handed keyboard and in this capacity it serves admirably. Ceci est effectivement un clavier modulaire qui vous permet de bouger chaque morceau a n'importe position, un de la qu'elle est comme un clavier gaucher comme le portrait a la droite. Le Freestyle2 offre de nombreuses charactéristique uniques qui sont ergonomique mais autre gens aimes comment ils peuvent l'arranger comme ils veulent, comme un clavier gaucher, et a cause de son capaciter, il peut vous servire admirablement. A4 Tech's exclusive 'A-shape' key layout provides a visual cue which for some users help to reduce ulnar deviation. A4Tech's design features a 'partially mirrored' numeric keypad layout (the enter, plus keys are on the left side of the keypad, but the layout of the keypad is still standard i.e. as though you moved it from the right side of the keyboard). 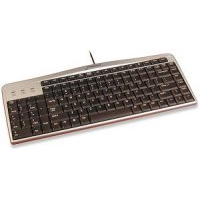 This economical inexpensive keyboard can help to balance out the user's workload, allowing the user's left-hand to operate the numeric keypad while the right hand operates the mouse. 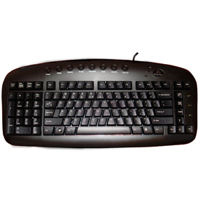 Many right handed individuals will also find this keyboard ideal as they can put the mouse where the numeric keypad would normally be, and still have access to the numeric keypad with their left hand when needed. The keyboard also comes with eight convenient hot keys to further improve your efficiency. IMPORTANT NOTE: The plastic underside of this keyboard often appears 'scratched' as it is softer than normal.